We are at the forefront of digital innovation. From the cloud to the blockchain, IoT, analytics, smart devices, and much more, companies are exploring opportunities to run smarter and redefine their business. Data is at the heart of such enterprises. Cheaper bandwidth and almost unlimited computing power have led to a data explosion. Never had we access to such vast amounts of information. According to estimates by Forbes*, “There are 2.5 quintillion bytes of data created each day at our current pace, but that pace is only accelerating with the growth of the Internet of Things (IoT). Over the last two years alone 90 percent of the data in the world was generated”. Rigid, software-based rules govern intelligent business process-Many of today’s business processes. This rules-based approach is limited in its ability to tackle complex processes. If we change the rules and let self-learning algorithms loose on the data, machine learning could reveal valuable new patterns and solutions that we never knew existed. Meanwhile, employees could be reassigned to more engaging and strategic tasks. Machine learning, which, loosely defined, is the ability of computers to learn on their own by using algorithms that churn through large quantities of data. As machine-learning–based skills approach those of human beings; it’s tempting to view their evolution as a zero-sum competition with humans that we are destined to lose. In most cases, says McKinsey, automation will take over specific tasks rather than entire jobs. Further, they say there is an opportunity to save an astounding US$3 trillion to $4 trillion annually through task-based automation. Machine Learning is apt at processing information. With recent advances, it has become easier to extract meaning from these unstructured and copious amounts of data. It essentially creates a holistic world of its own where machines can carry out activities based on context, interact without instruction, alter their behavior, and draw up their conclusions. This unlocks a treasured time for companies to pay attention to what’s most essential: innovation and creativity. However, creating Machine Learning capabilities and deploying them at large, traditionally required platform, skilled data scientists in the hordes, unlimited computing power and starting from scratch. The core of this machine-learning–enabled platforms is application programming interfaces (APIs). For enterprises looking to create the next big solution or product, the SAP Leonardo Machine Learning is a shot in the arm. The Leonardo Machine Learning Foundation provides advanced machine learning technology that helps applications recognize patterns and correlations in data. The foundation offers instantly consumable services that help you learn from data, extract knowledge, and gain new insights. The foundation helps add intelligence to enterprise applications without the need for massive computing power or the efforts of hordes of data scientists. Using SAP Leonardo, customers can seamlessly access SAP’s products and components across various innovative technologies such as big data, the blockchain, and IoT. SAP Leonardo opens up a plethora of opportunities to new data-driven business models that connect customers and digital service providers. The Machine Learning based enterprise-grade platform not only intelligently connects things with processes and people across various domains, but also through business network solutions for increasing productivity and better-unparalleled collaboration. For instance, SAP Leonardo via Optical Character Recognition (OCR) can be used to in legal products and services such as client contract review and management issue resolution. It can analyze contracts in bulk amount as well as individual contracts, thus, helping sort out the contract in less time minus any human errors. This approach allows companies to resolve business issues by reducing the need for human intervention in rule-based processes. Companies can connect to their ecosystems to enhance customer engagement and collaboration, bring more transparency, and create value. SAP Leonardo’s Machine Learning capabilities pave the way for new-networked business models, such as value-added applications and services. Regardless of which industry you are, conversational AI will be all pervasive. Integration is the key, and this is where SAP Leonardo significantly helps to find new processes to build performance, reduce costs and optimize running environments. 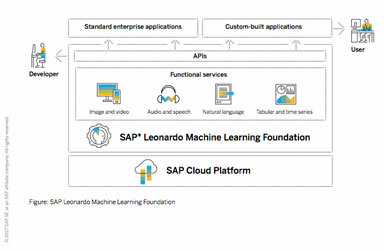 The combination of SAP and the Leonardo Machine Learning capabilities create the perfect foundation for businesses to make better decisions, offer innovative products, services, and business models; quickly and efficiently. While one can start small, the system is scalable that allowing for capacity building. Quite understandably, the SAP Leonardo Machine Learning Platform plays perfect foil in igniting the digital revolution.